Are there really any love spells that work? Of course there are, though not all spells will be perfectly successful all of the time. Finding the right love spells that work can take a bit of patience and practice. But don't give up! These love spells are all intended to be used when looking for some new love in your life. If you are looking for a lover return spell, or want to get your ex back, these other pages of spells will suit your purpose better. Use the red marker to write down the qualities you are looking for in a new love, being specific and realistic. Do not use names! Give the paper a spray or dab of your perfume, then fold it into the envelope. Hold the rose petals in your hand, and picture yourself with your ideal mate. Let yourself feel how happy you would be. Put the petals into the envelope with the paper, and seal the envelope. 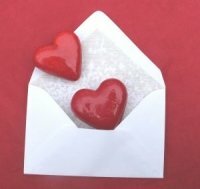 With a little lipstick on your lips, plant a big kiss on the outside of the envelope. Keep the envelope in a safe spot, and do not open it. Once you've found your new lover, you can simply throw it away or burn it. Just don't open it. What could be more romantic than a love spell with candles? They're not actually lit for the first part of the spell, but you'll get to see that flickering flame when the time is right. If you don't already have an altar space in your home, you'll need to clear a space to set this up because it takes several days for this love spell to work. Hold the white candle in your hand and think about all the qualities you want in a mate. Say them out loud while concentrating on the candle. It now represents your future lover. Take the other candle, and list the qualities that you will bring to this new relationship. This candle is you. Lay out the pink cloth, and set the candles in their holders on either side of the cloth (about 2 feet apart). In the center of the cloth between the candles, draw a large heart in chalk. Every evening, focus on both candles and concentrate on the relationship you are looking for. Then move the candles a little bit closer together. Do this each evening, until the candles are together in the center of the heart. How many days it will take depends on how you space the candles, but it should last at least a week. When both candles are side-by-side within the drawn heart, draw a second heart around the first one. Ask Aphrodite (or your preferred love Goddess) to grant you this request and finally light both candles. Light them each evening at let them burn as long as you can until they are gone. Be patient, it can take some time for this love spell to work. It's fun having free love spells online, isn't it? You can take your time and choose the spells that are perfect for you. Keep reading through the site for more free powerful love spells, including a few love potion spells. There are lots to try.